Frugal Creativity: Weekly Wrap: Some of Everything! Weekly Wrap: Some of Everything! Lots of updates for this week! Some are personal, some are bloggy, and some are other neat things I wanted to share. If you're a fan of family-friendly television (like Secrets of the Mountain), don't miss The Jensen Project. It's on NBC tonight at 8/7 central. To get involved in the campaign to promote more family-friendly TV, check out Moms 4 Family TV. Speaking of Mooseman, he just made a video ad for his website, and he would love for you to check it out. Prize winners! Congratulations to Linda Kish, who won a copy of Baby Body Signs, and also to jakiesmom, sandra, and Anita Yancey, who all won copies of A Maze of Grace. All winners have been confirmed. Looking for great, tasty recipes without the processed parameter? Download the free e-book from Molly Green and Econobusters.com and enjoy 22 pages of fresh and easy recipes, fabulous tips, and more! Full color, eye-catching photos with each easy-to-use recipe—easily print what you need! Here's a link where you can find more details and download Molly Green Fresh! I found the KettleWorx Six Week Body Transformation program to be fun, effective, and increasingly challenging. The Cardio workouts were especially challenging for me. My favorite workout was the Core series. I also noticed the most results in that area, which is very encouraging! Since I've been using the KettleWorx program, I've noticed that I have better muscle definition and tone, and, to a lesser degree, increased endurance. I chose to modify or skip a few of the moves to prevent back strain or knee pain; the makers of KettleWorx accurately describe the program as "intense," and I recommend that you heed the safety precautions. I recommend the program; just exercise appropriate caution. Disclosure: I received the KettleWorx program, at no cost to me, for review purposes. All opinions are my own, and your experience may vary. Before using this product, read the manufacturer's safety information and consult with your physician. I have not been compensated in any way for the other product mentions. wow my dear your garden is a cuke heaven :) I wish I had something for you. You could do like they do on iron chief and make the cool cucumber rolls but that is some fancy knife skills :). Good for you you'll get back on the program with it we all have some ups and downs with exercise :). Love the songs you always post. Love the reviews and info. I'm intrigued about that Kettleworx. I chuckle when I see the ad on tv, yet deep down I'm quite interested. Thanks for writing about it. Seventeen cucumbers?! Wow. That's fabulous. 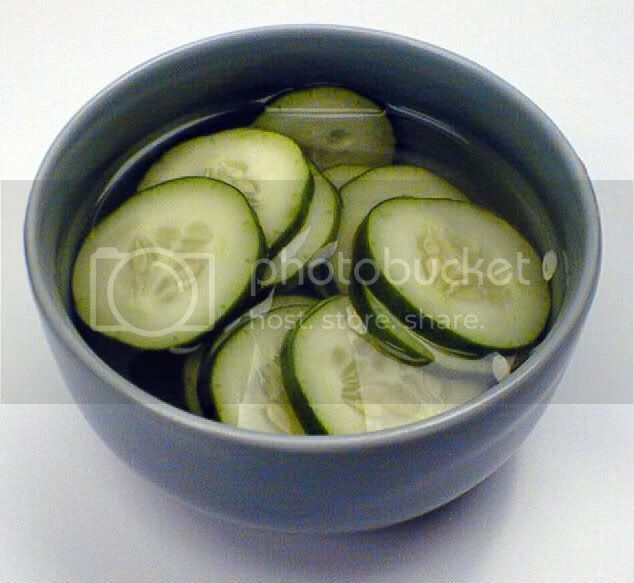 I wonder how dried cucumbers taste. LOL... I have no other ideas how to use them 'cause you've already done everything I know. That workout sounds great. I may have to look into that 'cause it targets the areas that I'd like improvement on: long lean muscles and core. Great review. I am looking forward to watching the Jensen show now even more. I had intended to watch it first and than expose kiddos to it later, but since it sounds like a family friendly show I may just let them watch with me. Hi Melissa, I am waiting for my first cucumber, and I can't wait anymore. You asked where you get rootbeer extract - it is where the flavorings are in your grocery store. Wal Mart tends to have it the cheapest. Have fun and eat a cuke for me. So cool your son has a blog. Was his "commercial" for his blog? Pretty inventive. If I liked cucumbers, I might grow them. My daughter is growing corn. it's so funny...we live in a suburb and we are growing corn! Checked out moosemans video..sounds like things are blowing up. I have been invited to a kettle class. I have several friends that love the workout. I appreciate you sharing your review. It helps me to understand it better. I don't want to look like a body builder either.